More than 500 schools in northern England and Scotland have closed because of poor weather conditions. Although forecasters say the weather is clearing up, police have warned drivers to continue to be careful on the roads. In Lancashire, the Army was called out to help rescue 70 people trapped in heavy snow. The 4th Battalion The Duke of Lancaster's Regiment freed 50 vehicles stuck on The Grane Road, between Helmshore and the M65 at Blackburn. The Met Office has forecast further outbreaks of rain, sleet and snow over north-east Scotland and some heavy showers in Wales, Northern Ireland and the south and west of England. Electricity company NEDL is still investigating after 1,600 homes in Scarborough and the North Yorkshire moors lost their power. The company said the weather was hampering its efforts to fix the problem. In Kelso, on the Scottish Borders, hundreds of homes had no gas supplies for a third night, with engineers trying to reconnect the 350 out of 3,000 properties still affected. Snow was reported in Argyll, Dumfries and Galloway and on high ground throughout the country - but the weather was not as bad as it was feared it would be. Forecasters said this was because temperatures had risen slightly during the night, transforming much of the expected snow into rain. But strong winds caused drifting, which led to roads being shut and lane closures on dual-carriageways on higher ground. In Lancashire, 180 schools closed because of the weather while heavy and drifting snow in parts of County Durham and Darlington were also reported. 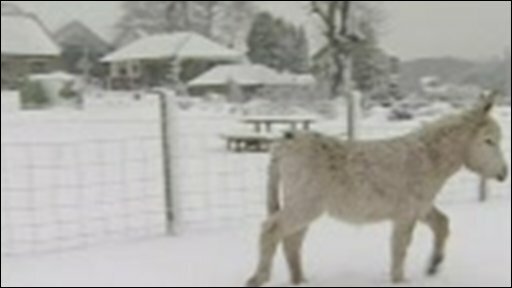 About 200 schools in Yorkshire and 119 schools in Greater Manchester also shut because of the snow. In Blackburn, all football matches due to take place on council pitches have been postponed. In Dumfries and Galloway, where 15cm (5.9in) of snow fell in some places, 16 schools shut their doors, with a further 10 in Aberdeenshire closed or partially closed. Passengers at Leeds Bradford International Airport faced "indefinite delays" because of the snow. Police also warned motorists of hazardous driving conditions. A spokeswoman for North Yorkshire Police said accidents had occurred as icy conditions had caused vehicles to skid off the road. Blizzard conditions have closed the A66 Trans-Pennine route westbound between North Yorkshire and Cumbria and problems have been reported on the M62. The A1 northbound has closed after a lorry jack-knifed between junctions 56-57 and Durham Police has closed the snow gates on the A66 at Bowes both ways until heavy snow subsides. Northumbria Police warned motorists taking the A1 north of Alnwick to be careful. They blamed snowfall for a number of accidents as drivers crashed into parked cars. In County Durham, a police spokesman said: "There are problems on the roads pretty much everywhere you look." The main travel routes in Scotland are open, although the A9 is "passable with care" at Drumochter. A Met Office spokesman said: "The main risk is for falls of snow across the north Midlands, northern England and Scotland. "On higher ground we could see up to 20cm and lower down and in more populated areas 2cm-5cm (1in-2in) is likely." The AA advised commuters to keep to main roads and drive at a speed suitable for the conditions. AA president Edmund King said: "Commuters can help themselves by checking information on the local weather and travel situation, following practical tips like not leaving your car on a sloped drive overnight, and thinking about walking or using public transport if practical." Meanwhile, bookmakers have cut the odds on a white Christmas. Ladbrokes cut the odds for one in London to 11/4 from 3/1. Glasgow is 2/1 to see snow, from an opening quote of 8/1. Birmingham, Liverpool and Manchester are at 4/1. 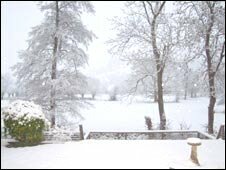 Send your pictures and videos of snow to yourpics@bbc.co.uk or text them to 61124. If you have a large file you can upload here.